IT experts, advanced users and system administrators can make use of our command line JPEG converter 2JPEG. It lets you batch convert PDF and image files to JPG, quickly resize image files, place watermark on photos, change the quality of JPG files, create thumbnails and schedule file conversion at a specific time. If you often need to transform multiple XPS files to JPG with various parameters, 2JPEG may come in handy. 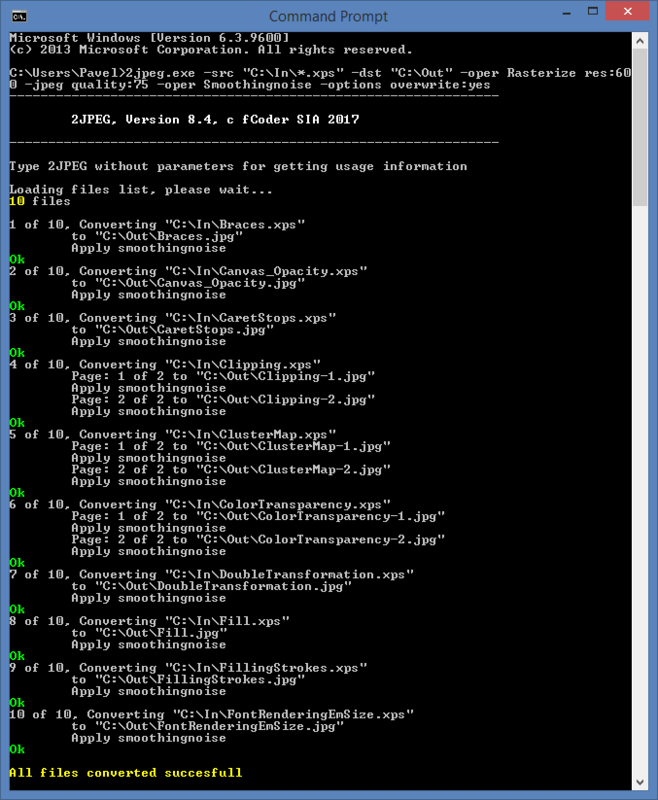 The full list of 2JPEG command line parameters is available on this page. "Working at a magazine publishers means we work with PDF and XPS files daily. One of the greatest needs in today's market is publishing our content online. After testing several other products on the market which offered the ability to convert our magazines to an online format such as JPEG, we found that 2JPEG offered the very best in speed, quality and reliability. It is simplicity and support offered by 2JPEG means anyone in our office can use the tool to create images of the magazines whenever they need with amazing results." XPS files can be opened by XPS Viewer, which is installed by default in the latest versions of Windows including Windows Vista, Windows 7, 8 and 10. You can install the XPS Essentials Pack to open XPS files if you're still using Windows XP. 2JPEG works under 32-bit and 64-bit versions of Microsoft Windows XP, Windows Vista, Windows 7, Windows 8 and Windows 10. It supports Microsoft Windows Server 2003, 2008, 2012, 2016 and later versions. The XPS format (*.XPS; OpenXPS *.OXPS) was created by Microsoft as an alternative to PDF. It is now much less popular than PDF, but some companies still use it, and the latest versions of Windows continue to include better support for XPS files than PDF files. This file format represents a document with fixed layout, keeping all the elements and the structure of the document intact. XPS format also supports features that you’d find in PDF format, such as digital signatures and digital rights management (DRM). In addition to batch conversion via command line there's a few other ways to do it. You can do it automatically, offline or online, via desktop software, via a virtual printer, or even from your own software or script file. Learn about different ways to convert XPS to JPG in our blog!